How can I find out which add-in causes a problem? If you encounter a problem, it is often hard to tell where the root of the problem is: in think-cell, some other add-in, or PowerPoint/Excel itself. It is possible that there is quite a number of Office add-ins installed that you are not even aware of. think-cell includes a tool named TCDiag	that can help you find out which add-in is causing the problem. 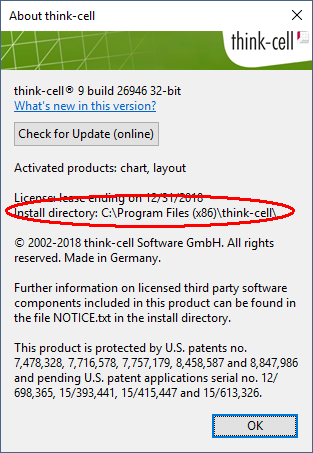 TCDiag is delivered with think-cell and you can find it in the think-cell installation folder. Within TCDiag, you find a PowerPoint tab and an Excel tab, each listing the installed add-ins of the respective application. Unticking an add-in here temporarily disables it for the next start of PowerPoint or Excel. You may have to resize the table columns to be able to read the add-ins' names and paths. Note: Some add-ins may appear inaccessible (greyed-out) in the add-in list of TCDiag. This indicates that the add-in was installed by an administrator, but TCDiag is currently running without administrative privileges. If you have the necessary privileges you can right-click tcdiag.exe and choose Run as administrator. If this does not work please approach your company's IT support. Windows Vista and Windows 7: Task Manager → Processes. Windows 8, Windows 8.1 and Windows 10: Task Manager → More Details → Details. and close any POWERPNT.EXE and EXCEL.EXE processes. In tcdiag.exe, clear all checkboxes in the Enabled columns on both the PowerPoint and the Excel tab to temporarily deactivate all add-ins. Start PowerPoint or Excel, and check if the error that you observed is still present. If it does, then it is an internal problem of the Microsoft application and most probably unrelated to any add-ins. You should make sure that you have the latest patches for your version of Microsoft Office installed, and if you have, you should look for a solution in Microsoft's knowledge base or contact the Microsoft Office Support. Again, close all PowerPoint and Excel windows and make sure that there are no hidden PowerPoint and Excel processes running anymore in the Windows Task Manager. In tcdiag.exe in the Enabled columns on both the PowerPoint and the Excel tab, tick think-cell and untick all other add-ins. If it does, then this seems to be a problem triggered by think-cell. Please contact us as described below. Close all PowerPoint and Excel windows and make sure that there are no hidden PowerPoint and Excel processes running anymore in the Windows Task Manager. In tcdiag.exe in the Enabled columns, choose a certain combination of add-ins. For example you can try all other add-ins apart from think-cell, and combinations of think-cell and one or two other add-ins. Repeat step 1. - 4. until you have established a minimal combination of add-ins that triggers the error. If the error occurs when think-cell and another add-in is active, please contact us and the other vendor as explained below. If the error occurs when think-cell is not active, think-cell is most likely not involved in the error. In this case please contact the vendors of the add-ins that need to be active to make the error occur. contact the other vendor, who can then either give us a test version of his product or do the troubleshooting himself. In case the other vendor wants to do the trouble-shooting, he may contact us to obtain a test license of think-cell. It is possible that on close examination we determine that the problem lies with the other add-in. In this case, our experience shows that the vendor often will not act if we contact him directly. Instead, you as the customer must open a support case with the vendor. Please pass on our full contact data and let them know that we are happy to provide a more detailed explanation.